For 20 years, the United States and Peru have worked together to reduce illicit trafficking of Peruvian cultural objects and support sustainable protection of archaeological and Colonial period cultural resources. This week, the United States and Peru will extend their Memorandum of Understanding (MOU) to continue import restrictions on archaeological and certain Colonial period material from all areas of Peru. Originally signed in 1997, the MOU and associated import restrictions will be extended for an additional five years and will include Colonial period documents and manuscripts for the first time. This extension will allow U.S. law enforcement to continue combatting the trafficking of Peruvian antiquities. Over the years the United States and Peru have worked closely to ensure that looted and stolen items are returned to the rightful owners, in fact, the United States has repatriated over 2,000 items to Peru. 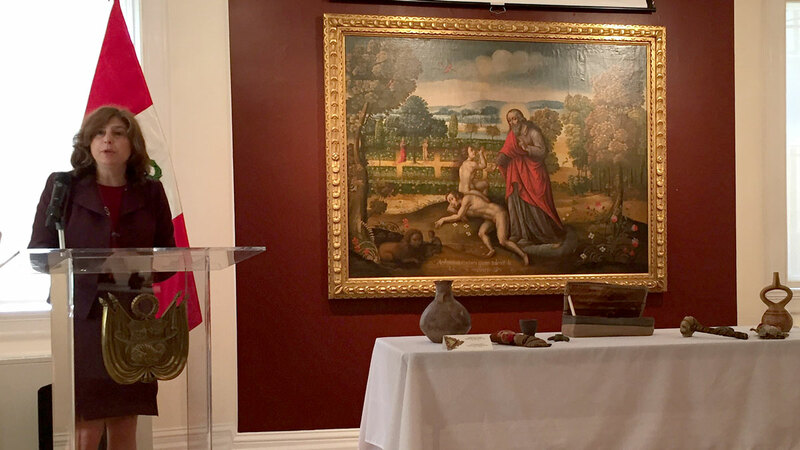 As an example, on June 6, the U.S. government repatriated to the Embassy of Peru in Washington, D.C. about 75 archaeological items and one Spanish colonial painting obtained in raids. Next week in Lima, Peru’s Ministry of Foreign Affairs will open an exhibition celebrating all of the repatriations that have taken place over the life of the MOU. "The FBI has the honor of repatriating these artifacts of significant cultural importance to the Peruvian people,” said FBI Supervisory Special Agent Timothy Carpenter. “This repatriation represents our commitment to protecting and preserving the integrity of cultural history, whether it be here in the U.S. or abroad, and to working with our partners across the globe to make sure stolen and looted artifacts recovered in the U.S. are returned to their rightful home." “Combating transnational crime is a top priority for the United States in Latin America. We at the Department of State also work to enforce the rule of law in these cases. Moreover, for us, like everyone here today, there are more than legal implications. There are significant moral, historical and scientific implications, as well,” said Deputy Assistant Secretary of State for Western Hemisphere Affairs Mara Tekach. To encourage academic institutions, NGOs, and other organizations to preserve and protect Peruvian cultural patrimony with technical assistance, expertise and resources. For the Government of Peru to expand opportunities for international exchange of cultural items, streamline the process for approval of applications for temporary export, and consider allowing longer-term loans to museums and academic institutions to develop educational programming. For the U.S. government to facilitate provisions of technical assistance in cultural resource management. Read more about the history of this MOU and how the United States and Peru began protecting cultural property in the region here.